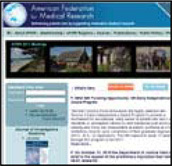 Of the AFMR, as we prepare for our 2011 regional meeting, held in Carmel, California, January 26 – 29, 2011. The meeting will open with a symposium, "Global Health: The Specter of Cancer, Malnutrition and Infection" with talks on cervical cancer prevention, Vitamin D deficiency and TB, and Drug Development for Neglected Infectious Diseases on Wednesday. This will be followed on Thursday morning by a plenary session continuing the global health theme with talks on the current challenges in global health, global nutrition, the impact of iodine and environmental toxicants across the world, and the impact of obesity on global health. On Thursday afternoon, the WAFMR Outstanding Investigator Award.